Epic Entertainment & Express Deliveries in association with Zee TV Africa brings you The Last Empress - Asha Bhosle in her Farewell Tour. 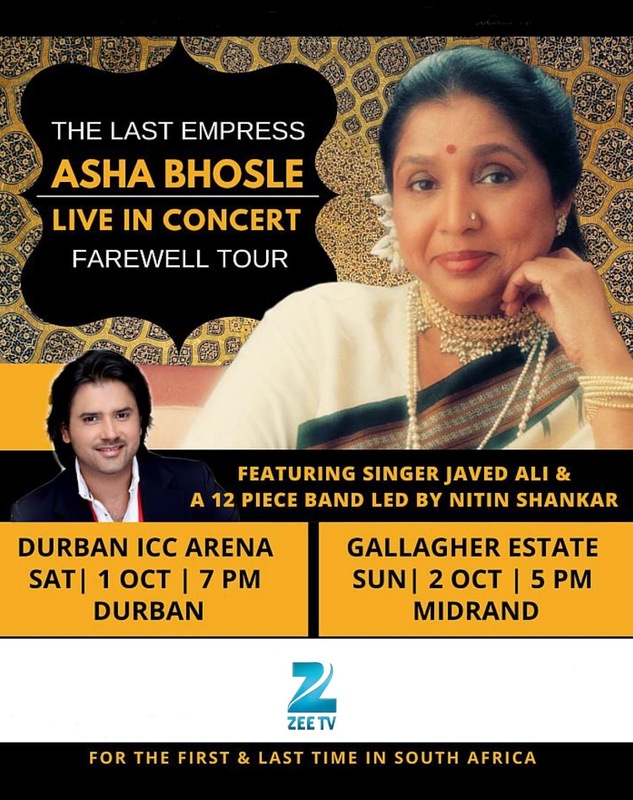 India's iconic playback singer will be on her Farewell Tour in South Africa at the Durban ICC Arena on Saturday 01st October 2016 and on Sunday 02nd October 2016 at Gallagher Estate, Johannesburg. Asha Bhosle is one of the distinguished voices and icon of the Indian music fraternity. The vivacious songstress has 13,000 songs cutting across various genres amassed in her musical repertoire. Bhosle, 82, has been a celebrated part of the Bollywood music scene for seven decades. She has sung songs for over 1,000 Bollywood film scores. Her singing hits include Chura Liya Hai tumne Jo Dil Ko, Lekar Hum Diwana Dil, Tanha Tanha, Dil Cheez Kya hai, Dum Maro Dum, O Mera Sona Re amongst thousands others. During her illustrious career, Ashaji has collaborated with artists across the world from Boy George, to Michael Stipe, to Australian cricketer, Brett Lee. Ashaji's contribution to Hindi cinema is exceptional and her South African fans can pay a fitting tribute to her, when she performs in South Africa. Music lovers can expect nothing less than a remarkable evening filled with the myriad flavors of her long and illustrious career. This iconic and versatile singer is billed to perform in her first and last live performance in South Africa. The shows will also feature the tremendously talented Javed Ali and a twelve-piece band led by Nitin Shankar.